What Sinister Secrets Lurk in the Shadows of Yesterday? Natchez, Mississippi—Private Investigator Nate Price and his new wife, Isabelle, need a vacation. Their coworkers generously team up to surprise them with a belated honeymoon…but the happy trip turns sour when Izzy spies her ex-husband, who appears to have taken up his gambling addiction once again. While the boss is away, Price Investigations remains in the hands of Beth Kirby, a former police officer, and Michael Preston, a former forensic accountant. Hardly a dream team, as Beth resents working with a man who has no experience in his new job. 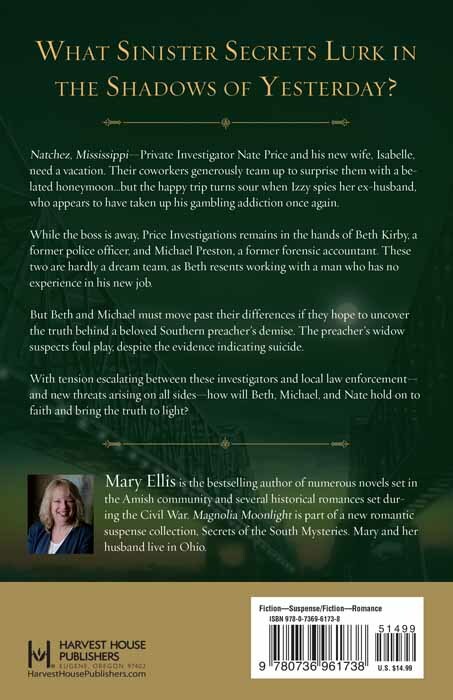 But Beth and Michael must move past their differences if they hope to uncover the truth behind a beloved Southern preacher’s demise. The preacher’s widow suspects foul play, despite the evidence indicating suicide. With tension escalating between these investigators and local law enforcement—and new threats arising on all sides—how will Beth, Michael, and Nate hold on to faith and bring the truth to light? "The next in my Secrets of the South Mysteries, Magnolia Moonlight, took me to Natchez and Bay St. Louis, both in Mississippi. Natchez in a lovely town sitting high on a bluff above the Mississippi River, and Bay St. Louis is a vacation destination along the Gulf Coast. Price Investigations hires two new PI's to investigate the suicide of a Baptist minister after his wife suspects murder. When Nate and Isabelle leave on their honeymoon, everyone ends up with more than they can handle in my brand new romantic suspense." "Ellis's tightly plotted mystery is exciting and involved. The humorous banter between Beth and Michael keeps the story light, and the growth of their relationship feels natural alongside the more remarkable circumstances of the pastor's death. A fine balance of suspense and romance." "Ellis's third entry in her Southern-flavored series is an edgy police procedural, ideal for Greg Iles fans and crime fiction devotees seeking in immersive reading experience." "An exciting murder mystery that will grab any whodunit fan's attention, this story weaves well-written, complex characters with a captivating reading experience. Several adult themes are discussed, like gambling, murder, and romance, but are all done through a Christian lens." "This is the third book in the 'Secrets of the South Mysteries' series. I've enjoyed each one, even though mysteries are not my go-to genre to read." "I highly recommend this book to all mystery lovers, and fans of well-written fiction. Get a copy as soon as possible!" "Two mysteries in one, makes this book an exciting read.... You won't want to put this one down, til you find out Who-done-it!" Five Stars. I loved it! I liked the main characters for their kindness, generosity, and ability to forgive. I appreciated the way that the author handled the social problem of gambling addiction. The people in this book intrigued me so much that I bought the first two books in her Secrets of the South Mysteries. A delightful quick read with great character development and a totally immersive plot! Loved it, will be reading the rest in the series. I like Mike. He’s enthusiastic and raring to go. He wants to prove himself. I’m waiting to for the sequel. "Ellis's great strength is her characterization. She never goes for the 'stock' character or situation, always surprising the reader with plot twists and surprising insights in human nature. As I believe I said in my last review of her books in this series, the only trouble with being a fan of her books is waiting for the next one--good thing she's so prolific!" "Very good book. Nice and upbeat. Good characters. I really enjoyed it." 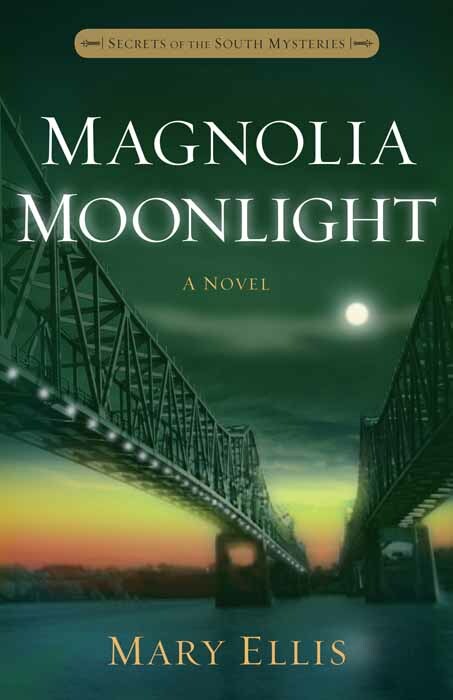 "Once again Mary Ellis has reached out and grabbed me on the first page of her new novel Magnolia Moonlight and kept me riveted until the book's completion. Somehow she combines intrigue, romance, and humor and makes it all blend wonderfully."